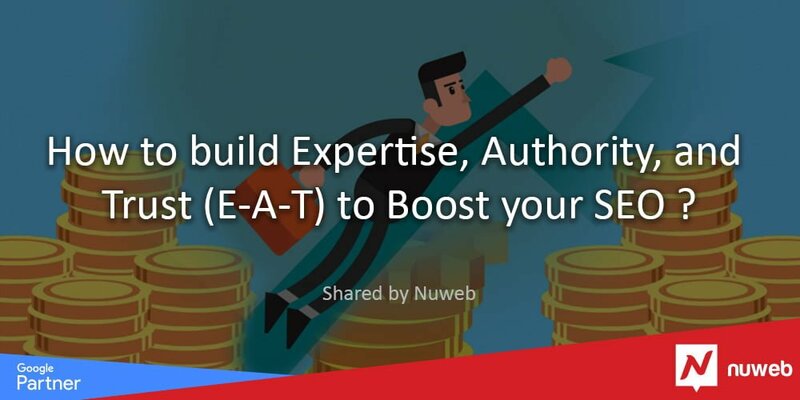 How to build Expertise, Authority, and Trust (E-A-T) to Boost your SEO ? 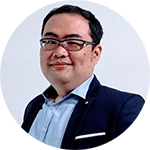 09 Oct How to build Expertise, Authority, and Trust (E-A-T) to Boost your SEO ? Ever since Google realized that the building blocks around which its ranking algorithm was built – links and content – were being gamed for profit, they have increasingly focused on identifying and incentivizing sites that provide beneficial and contextual information to their audiences. They have made every attempt to reward those who build a brand with SEO by chasing users instead of chasing the algorithm. 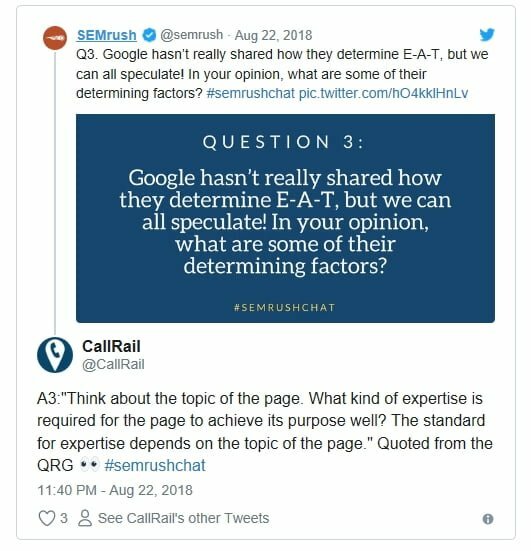 To provide high quality and highly relevant search results across the board, Google has zeroed in on a paradigm called E-A-T (Expertise-Authoritativeness-Trustworthiness) to assess the usefulness and accuracy of content on every webpage they crawl. Q1. 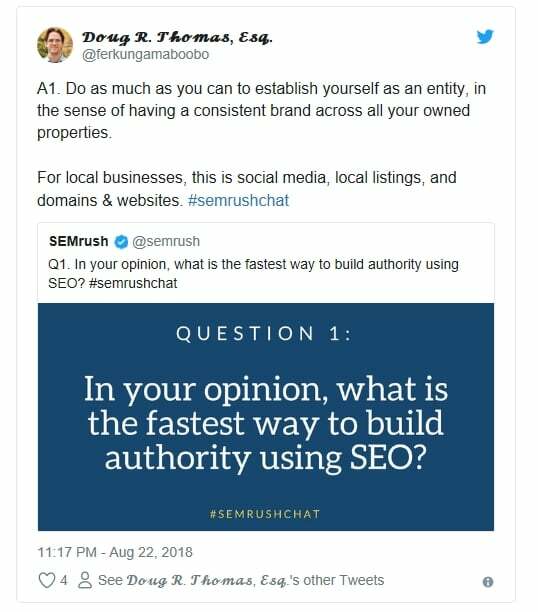 In your opinion, what is the fastest way to build authority by using SEO? 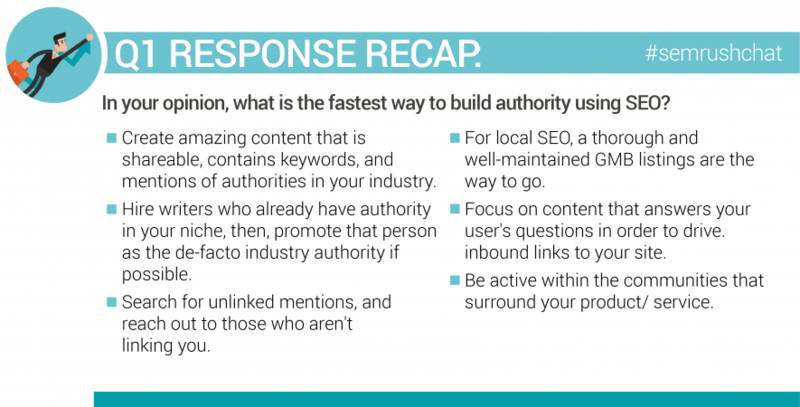 There is no single path or shortcut to building authority and trust in SEO. 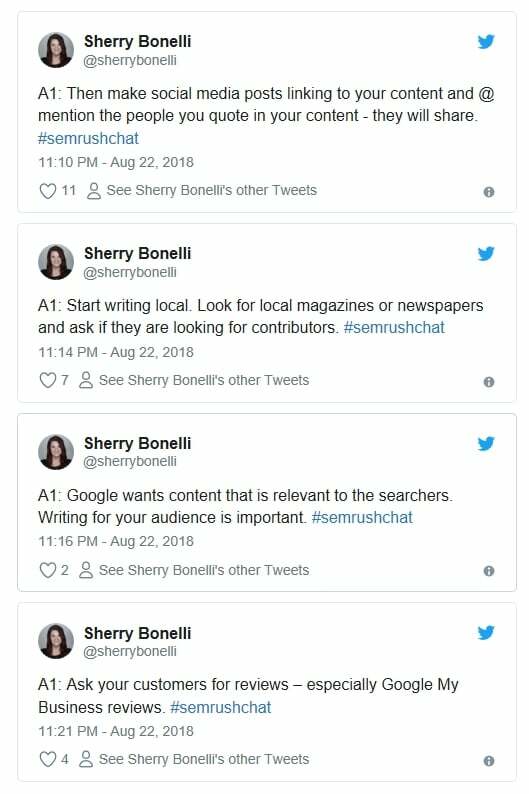 Sherry outlines a lot of different ways, starting with great content, which is shareable, contains keywords, and highlights the opinions of thought leaders in your industry. Once you have that base, try and promote your content on social media. Mention the people whom you have quoted – that might get you a ripple effect. Contact local media and find out if they will run your opinion pieces. Always keep your audience in mind when you do that. 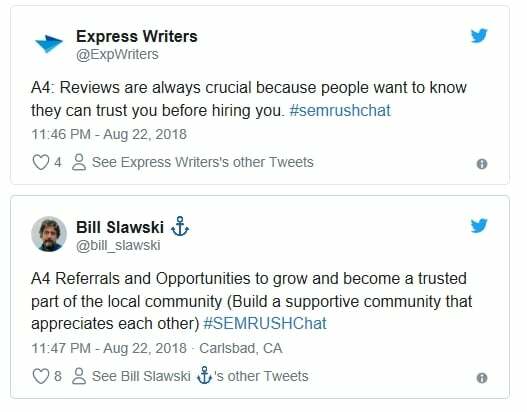 Further, Google uses reviews as a trust factor for SEO. Request customers leave online reviews for your business, especially on your Google My Business page. Everyone agreed that building authority using SEO takes time. 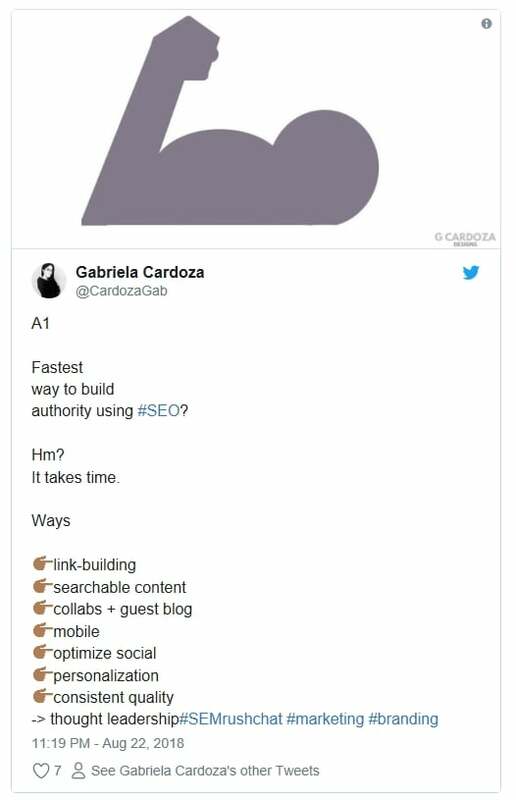 It is a complex mix of link building, content marketing, guest blogging, targeting mobile devices, personalization, and social media marketing. The most important thing to do is maintain the quality and frequency of your content. Your brand messaging needs to be consistent across all your digital properties if you want to establish yourself as a brand to be reckoned with in the eyes of Google. It is people, not technology, that will help you develop this authority. Hire industry experts to work for you and write for you. Promote them, their work, and their thoughts on your website and other owned properties. Publicize them as the face of your brand. Don’t forget to keep doing SEO though – make sure you get your schema markup and My Business page information right! As you build up trust and visibility with consistently good content, more people will come to you for information and advice. Aim to be indispensable to them. Don’t just talk about your brand; remain active in your community and get yourself involved in every conversation to which you can add handy inputs. Q2. 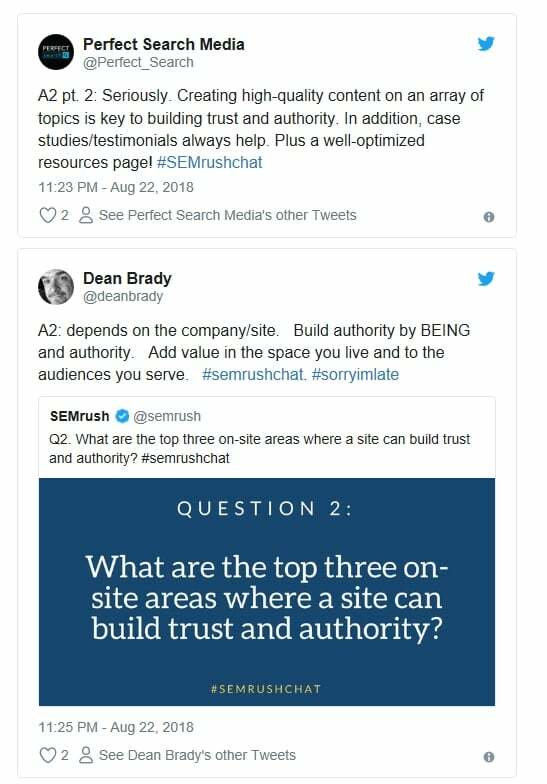 What are the top three on-site areas where a site can build trust and authority? Use your “About Us” page to show off major media publications where you have been featured. Implement schema markup on your site to give Google auxiliary information about your content. Create a separate page to list customer reviews and testimonials. High-quality content on a variety of topics related to your industry is key to building authority and trust among your customers. Of course, it depends on the nature of your website, your industry, and the audience you are targeting. 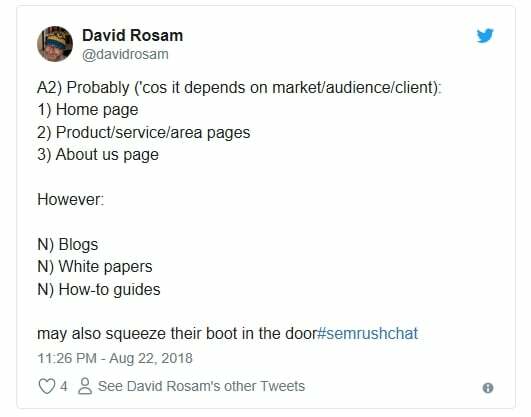 SEMrush’s Content Marketing Toolkit gives you an array of tools to audit your existing content, research new topics, plan and publish SEO-focused articles, see who is sharing your posts, and track the performance of this content vis-à-vis your competitors. 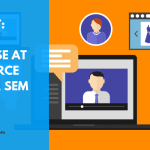 Bear in mind that any content you create and distribute has to be laser-focused on your users’ needs; it shouldn’t be cluttered with sales pitches. Dawn Anderson reminds us that the real builders of trust for your brand are your people, the team that is making your organization great every step of the way. Q3. 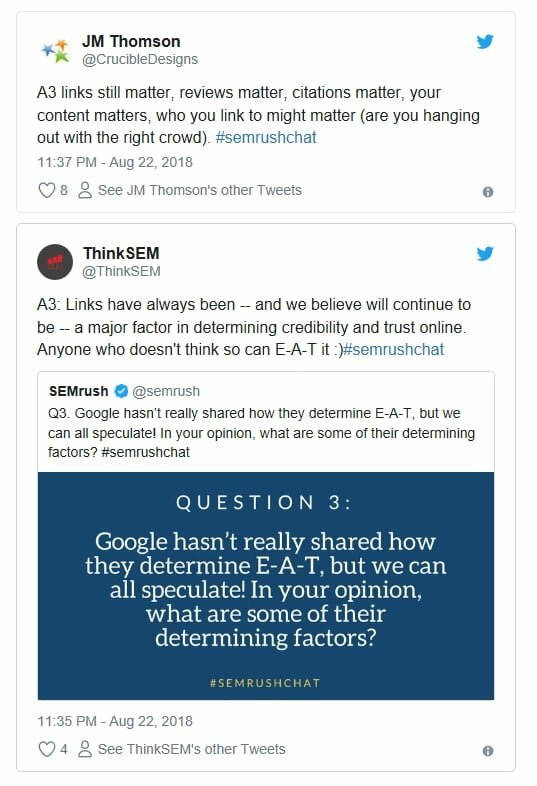 Google hasn’t really shared how they determine E-A-T, but we can all speculate! In your opinion, what are some of their determining factors? According to Sherry, the quality of your content is the single most important factor influencing your page quality rating. “Quality” is not a subjective factor here; it is determined by the benefits it offers to your users. 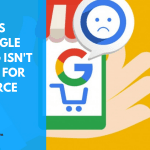 Mind you, if your content isn’t providing any value to your customers and simply promoting your business, Google will definitely ignore it. Begin by understanding what E-A-T is. Then analyze and fix your content to reach those standards. Always use these standards as a benchmark while crafting new content. The shares, links, engagement and brand awareness that you get as a result will be the measure of the trust your audience has in you. A simple guideline would be to follow human thinking patterns while assessing your trustworthiness. Does your organization have a human side to it? The topic you are talking about is central to the trust and authority you garner from your content. Do you really have expertise in that topic? How is it related to your business? How will your users benefit from what you have to say? Links still matter very much in deciding authority. Google’s PageRank algorithm was built on the back of links, and links are still one of the biggest factors affecting ranking. Q4. 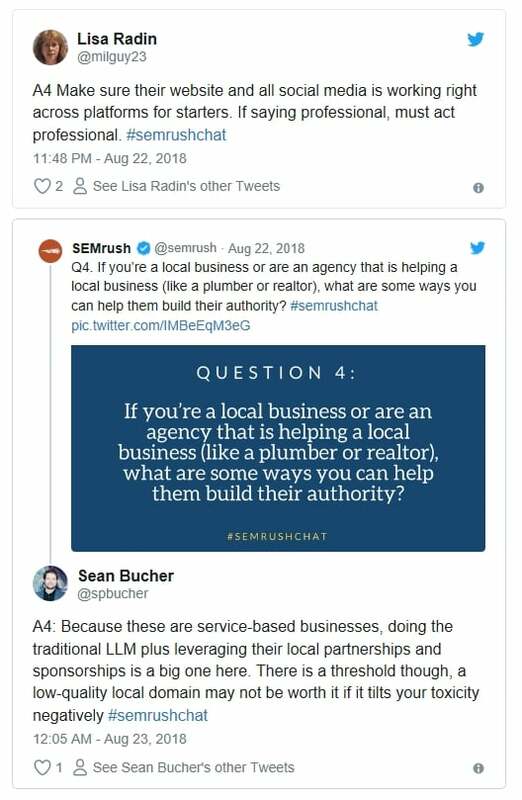 If you’re a local business or are an agency that is helping a local business (like a plumber or realtor), what are some ways you can help them build their authority? Being interviewed on a podcast, guest blogging and receiving awards are Sherry’s preferred ways of building authority for local businesses. Start by getting your domain and website fully functional, so that you project a professional image. Pay attention to the real-world, traditional marketing you already do and get the basics right. Citations from business directories and other prominent sites in the region are crucial to building authority for local businesses. Continually track these citations and make sure your Name, Address and Phone number (NAP) are consistent across all listings. You also need to put a local link building program in place. Soliciting customer reviews, responding to them and engaging customers in conversation will help local businesses like no other. Schema markup and Google My Business (GMB) will help you remove any ambiguity that Google might have about your business details. Don’t just focus on GMB – go to all social platforms where you can find customers and where they can find you! Reply to all reviews, across the board. Social signals are great for building your online reputation. Scour your local Facebook Groups and other places to see where you can join the conversation. 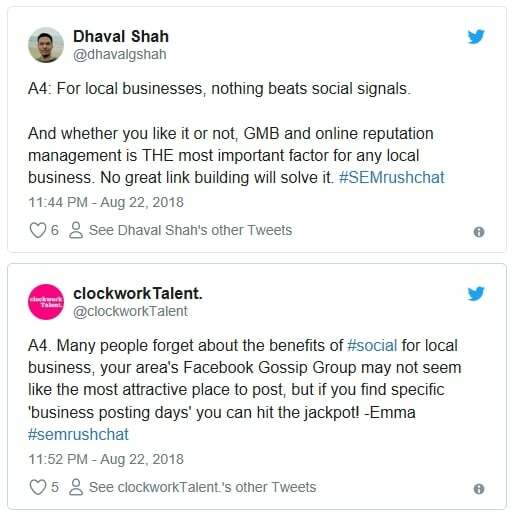 Again, you need the right mix of authoritative content and links from local websites. Your content needs to be very relevant and contextual to your niche, as do your links. Work with other local businesses to understand your customers better and provide the right answers. Link and refer to each other at every available opportunity. It is critical that you don’t ignore the local community and keep yourself visible and active there. 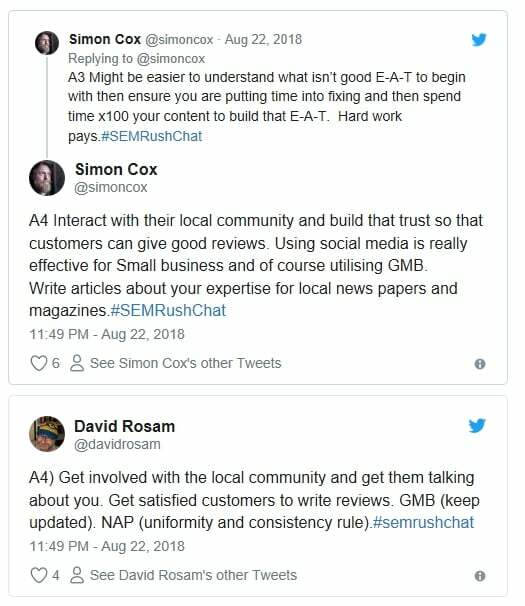 Encourage community members and customers – especially satisfied ones – to leave reviews and don’t be afraid to respond and build your brand messaging around these reviews. The more reviews you have, the more chances a potential customer will trust you. Finally, leave no stone unturned in making your community better. Supporting each other is the best way for local businesses to grow and build trust. Q5. 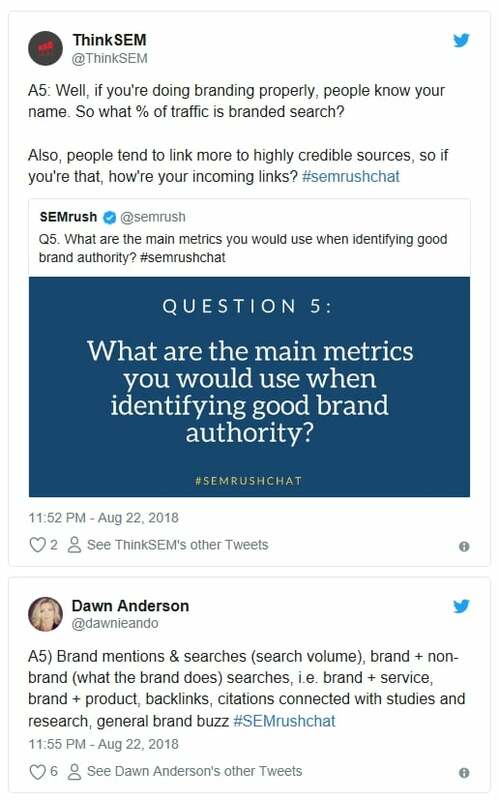 What are the main metrics you would use when identifying good brand authority? An impressive brand reputation is the best measurement of authority and trust if you ask Sherry. Follow best practices to safeguard your online reputation at all costs. 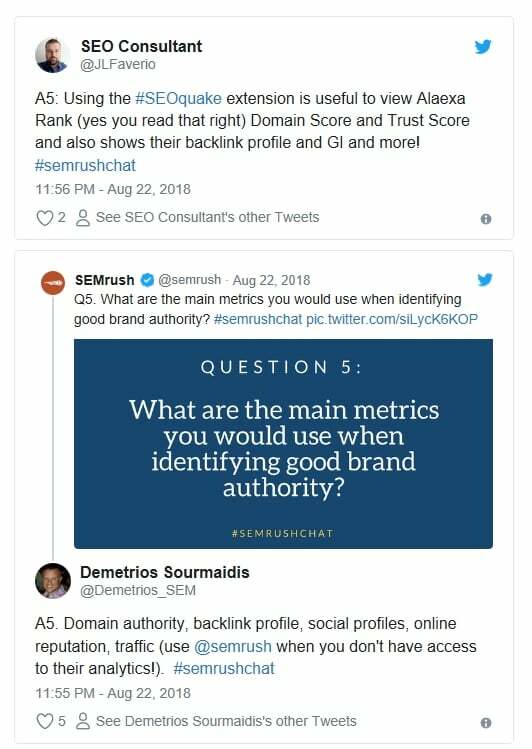 Online metrics such as SEMrush’s Domain Score and Trust Score will give you an indication of your site’s authority in terms of SEO. Your backlink profile and social media presence will add to the trust factors that influence your online brand authority. Use these metrics to build on your UX and content quality. If your brand is well known, it follows that people will recall it and search for your products by your brand name. See what percentage of your traffic comes from branded searches. See what other terms they’re searching for along with your brand – are these related you your business or niche? Another yardstick is the quality of backlinks to your content. Are authoritative sites in your industry linking to you? Do they mention your brand name? In what context? Building expertise, authority, and trust (E-A-T) are important to Google and potential customers. 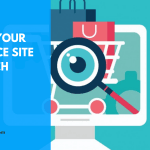 Having a trustworthy and authoritative presence online will help your SEO and build confidence in the people who are looking to purchase your products or services. Here are some ways to build expertise, authority, and trust. Write content that people want to know about. Make sure that content is about questions people are asking. 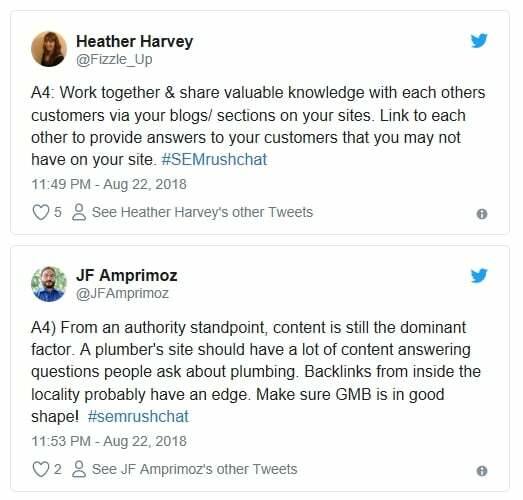 You can use the SEMrush topic research tool or a site like Answer The Public to find out what real people want to know about a particular topic. 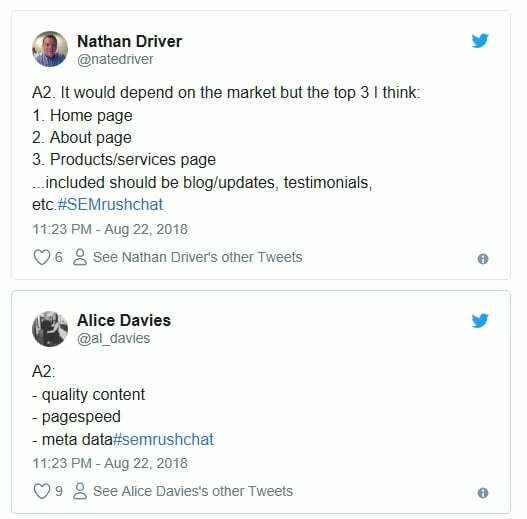 In the content you write, use SEO best practices and cite authoritative sources. 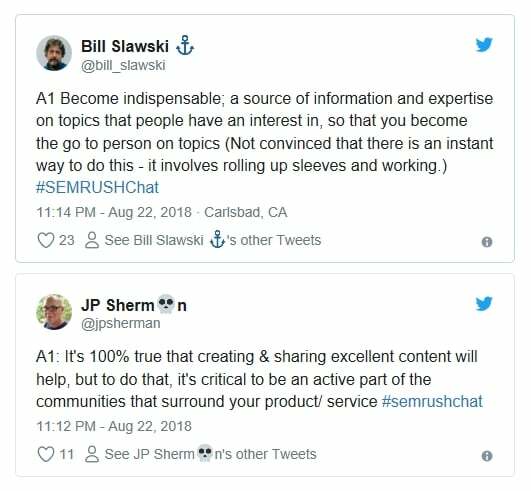 Mention those experts and sources in social media posts, and you’ll increase the likelihood that those authoritative sources will retweet or share your social media posts, which will increase your followers and get more visitors to your site. Google notices engagement and visitors to your website. Build your reputation and expertise by getting online reviews from happy customers and build your online authority. Online reviews are a known SEO ranking factor. Also, build your authority and expertise by getting publicity through public relations. Write press releases, apply for and win awards, get speaking engagements, write for reputable websites, be a guest on podcasts and webinars, etc. When you get any publicity for your company, be sure to write a blog post about that recognition and include on your “About Us” page. Be sure to include logos (with permission, of course) of the sites you’re featured on. That shows visitors quick visual proof of your credibility and helps build trust, letting potential customers know you are better than your competitors. 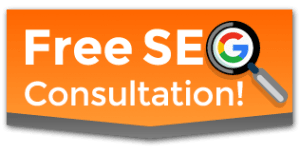 Use on-site SEO strategies to boost SEO and tell Google more information about your pages. On your “Contact Us” page, be sure to embed Google Maps. 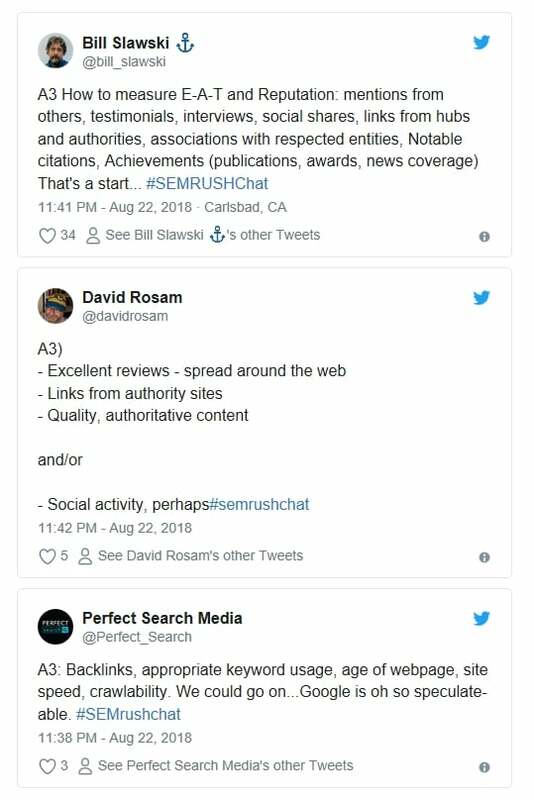 To do this, go to your Google My Business listing, click on the “map” image, click the Share button and copy the HTML code to create a hyperlink. You can then use this link as anchor text on your page. As a “top-secret tip,” embed driving directions in anchor text, too. It’s also a good practice to name image files with keywords and geolocations (i.e. Toyota-cars-cedar-rapids.jpg) and then actually geotag the photo itself. You can go to geotagmyphoto.com to add a geotag to the actual photo! There are many more ways to build your expertise, authority, and trust. 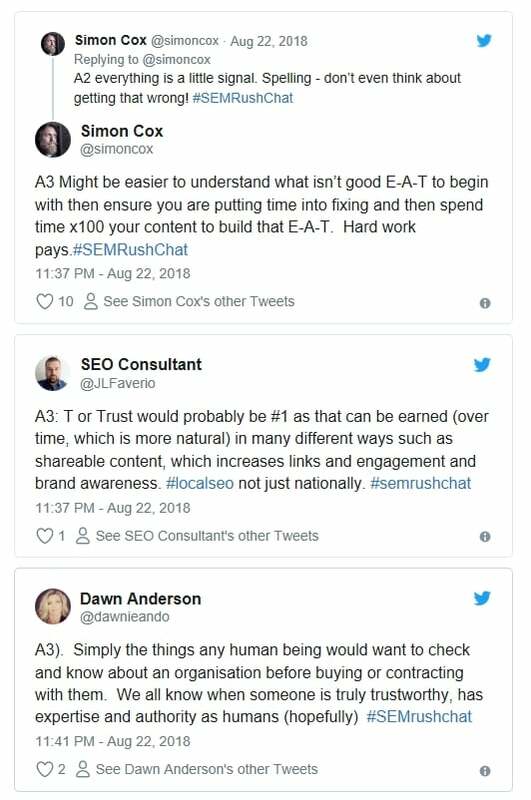 Google’s Quality Raters Guidelines talks a lot about E-A-T and how it impacts rankings, so it’s vital that you build in these strategies into your SEO efforts so you can build authority with Google and trust with potential customers. So get started with these efforts today! Good luck. That is all for today! We want to hear your thoughts, too! 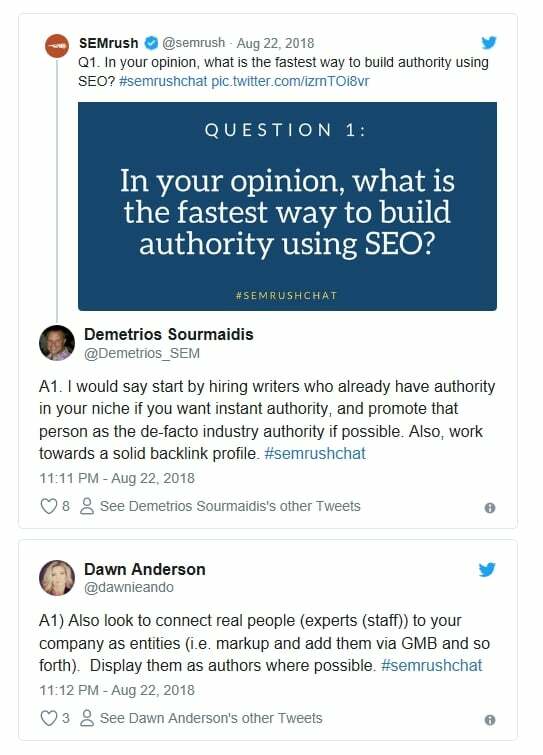 Share your authority building strategies with us in the comments, or even with a simple tweet mentioning @semrush and using the hashtag #SEMrushchat.